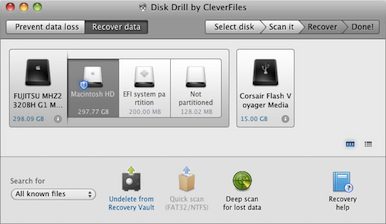 Cleverfiles has released Disk Drill 1.1, a new drive utility that preemptively protects your disk data and provides tools for data recovery in the event of a crash or accidentally deleted files. Disk Drill is perhaps most notable in its agnosticism about drive formats: it can handle crashed drives in Mac's own HFS+ format as well as Windows FAT and NTFS and lost data on solid state cards used in portable electronics. Disk Drill monitors file activity on your hard drives and stores recovery information while the files are still in good condition, using a technology Cleverfiles calls Recovery Vault. If and when a file is lost, you can restore it from the vault, or use a “deep scan” option to rebuild the file directly from the data still stored on the drive. Disk Drill also allows you to create a disk image of a hard drive that you fear might be failing—unlike standard disk images, this clone will be an exact copy of every byte on the drive, which will allow you to perform data recovery from the disk image if the drive becomes totally unusable. Disk Drill includes live Smart monitoring of your hard drives to alert you when something is going wrong. Disk Drill is available in a free basic edition that provides Recovery Vault protection and recovery, hard drive monitoring, and byte-level disk imaging. The free edition will scan a drive for lost files, but a paid version is necessary for data recovery. Prices are $89 for Pro (one user, one Mac); $169 for Expert (one user, unlimited Macs); and $299 for Enterprise (unlimited). Disk Drill requires Mac OS X 10.5 and runs on Intel or PowerPC Macs.